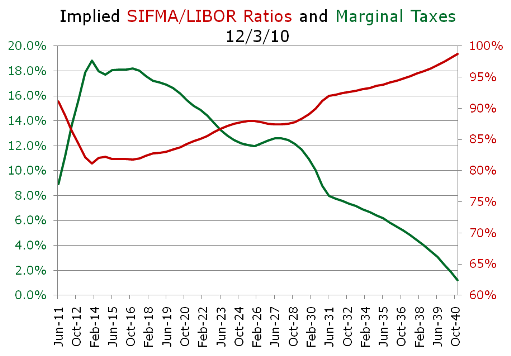 NEWSFLASH: SIFMA/LIBOR Shows Tax Rates Trend to 0%! As people soak in the joy (or tragedy depending on your perspective) of the latest apparent tax deal extending current marginal tax rates for a few more years, thought we'd check in and see what the money markets have to say about future tax rates. Many people may not know that swap markets provide a way to assess the almighty market's view of future marginal tax rates. Indeed they do and currently show a near zero value to future tax-exemption.